Carol is a lifetime resident of Evergreen Park. She was born raised and educated in Evergreen. She and her husband of 40 years, Gene, have two married children who are residents and homeowners here in Evergreen Park. Carol has been a Village Trustee since February of 1988. She is a member of the Finance and Laws and Ordinance committee. She is the chairman of the Citizen Services, Recreation and Youth Committee. Carol has a B.S. in Education, a Masters Degree in Special Education and 30+ hours in graduate level classes. 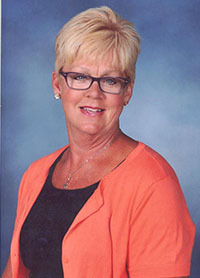 Carol recently retired as an Adapted Physical Education teacher, where she spent more than thirty years teaching children with and without disabilities. The last several years, she has coached various Special Olympic teams in Area 7. Carol is now cheering for her grandchildren, four of whom attend school in the Evergreen Park School District and in the EP Recreation Department Preschool Program.